“Power concedes nothing without a demand,” abolitionist leader Frederick Douglass declared 161 years ago. Last week saw that truth on broad display as Amazon, facing growing political and organizing pressure, announced it was setting a minimum wage of $15/hour for its US workforce and also raising wages in England. Amazon workers in Germany, Poland, and Spain struck on Amazon’s Prime Day in June, protesting appalling working conditions. Back in the US, Sen. Bernie Sanders (I-VT) went after the company for paying such poor wages that much of its workforce is dependent on public benefits like food stamps, housing subsidies, and Medicaid. And Amazon’s wage concession followed continued high-visibility mobilizations by Fight for $15 against McDonald’s and other corporate targets. Naturally, Amazon executives sought to pivot talk away from corporate concession and towards business enlightenment. The political establishment lavished kudos on the company, valued at $1 trillion, and CEO Bezos, whose net wealth tops $150 billion, for its generosity to workers. “An outstanding move,” gushed The Seattle Times editorial board in Amazon’s hometown. “Prime Amazon: In praise of the internet giant’s $15 hourly wage,” trumpeted the New York Daily News headline. Fellow billionaire Nick Hanauer teamed up with union leader David Rolf to heap praise on the company. “Amazon has smartly chosen to lead the way into the real economy, where we solve the problems, build the things, and pay the wages that truly make America great,” Hanauer and Rolf wrote just hours after the company made the announcement. Even Sen. Sanders, Amazon’s erstwhile nemesis, felt compelled to pile on, congratulating Bezos personally in a tweet. So much for the back-slapping and public optics. The view from the warehouse floor is a little more complicated. For while the raise certainly is a product of sustained pressure on the company, it’s not the game-changing largesse that Amazon’s public relations department would have us believe. In low-wage states like Kentucky and South Carolina, to be sure, the raises may amount to $2 or $3 an hour or more. But many Amazon warehouse workers, particularly on the coasts, already were paid close to $15/hour. And while rolling out the new wage rate with great fanfare, Amazon more quietly informed workers the company would be eliminating stock options and performance bonuses. For full-time workers in the company’s warehouses, those compensation add-ons had pushed them above $15/hour. But no more. Many full-time workers will see minimal raises—or even net declines. Facing sharp backlash, Amazon this week conceded they’d give additional pay raises to the full-timers to make up for the lost bonuses. How this latest twist plays out for the full-time workers remains to be seen. But suffice it to say, the raises won’t drain company coffers. Indeed, setting a $15 minimum wage for 350,000 Amazon workers likely will cost the company less than one tenth of one percent of its net worth: A pittance. Oct. 2 was the big announcement day. When a New Jersey fulfillment center manager excitedly announced the raise to a gathering of night-shift Amazon workers, the room remained silent, reported one of the workers. It was only when human resources staff started clapping aggressively that others gamely joined in, he said. “Workers hate the company. People feel they’re treated like they are slaves,” he explained. Workers at an Amazon warehouse outside Seattle, Washington, attributed the raise to Sen. Sanders’ advocacy and “people speaking up in an organized way,” according to a part-time distribution center worker. But the issues for Amazon’s workers go far beyond low wages, he said. The constant push for impossible levels of productivity, a lack of respect from supervisors, rampant workplace injuries, and continual burnout and workforce churn are what angers workers the most. Those issues share a common root: A business model that implacably demands that workers submit to inhumane levels of exploitation. 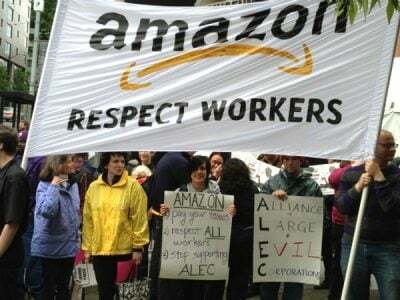 Unlike in Europe, where many Amazon workers have organized into unions, struck, and won modest gains, US workers aren’t yet unified in sufficient numbers to make big demands on the corporate giant. Will the splashy wage announcement head off incipient worker organizing? Quite to the contrary, asserted the Seattle worker. It will build confidence in organizing because it shows workers that the company will respond to pressure, he said. It will take a lot more escalation to win meaningful change. The Amazon workers I’ve talked to over the last year agree that the company won’t fix the appalling conditions until it is forced to do so. That will happen when workers build union organization and, united with consumers and allies, prove they can disrupt Amazon’s operations and hit the company’s bottom line. That may sound like a pipe-dream. But consider that 100 years ago the titans of the emerging production economy—think basic steel, auto, and electrical industries—seemed omnipotent and untouchable. It took years of struggle, including many tough battles and devastating losses, before the wave of 1930s plant occupations and strikes led by socialists and radicals of various stripes forged new industrial unions. In doing so, they boosted not just working conditions in the production sector, but propelled a broader social movement that organized and won public works jobs, Social Security, labor rights, minimum wages, and other gains of the New Deal era. Significantly, too, the same factors that shaped the meteoric growth of basic industry 100 years ago—the tremendous economies of scale achievable in mass production, the deployment of cutting-edge technologies, and the application of precise scientific management of production and distribution, including a just-in-time employment model—are core elements of Amazon’s business model today. The challenge, then as now, is for workers to recognize that as with the industrial monopolies of the last century, Amazon’s extraordinary sweep of power also is its Achilles heel—provided that workers organize. Alone, the Amazon warehouse worker is among the weakest of laborers in America; together in large numbers, they have the power not just to transform what it means to be a warehouse worker, but to help drive a new social movement in our country. It’s worth recalling that in November 2012, much of the political punditocracy was aghast when a relatively small coterie of New York City fast-food workers first hoisted picket signs demanding $15 and a union. Such an unrealistic demand! Now, six years later, more than nineteen million low-wage US workers have won raises through legislation and workplace organizing as a result, directly or indirectly, of the Fight for $15 movement. And yet, even with these gains, workers aren’t making it. Nearly eighty percent of full-time American workers say they live paycheck-to-paycheck, seventy-one percent are in debt, and most workers are unable to build up savings to get through a medical, employment, or housing crisis. America is, today, a nation of spectacular wealth enjoyed by the gilded one percent while tens of millions daily teeter on the brink of financial ruin and destitution. Many of those desperate workers, indeed, already are paid $15 an hour. It’s just not nearly enough to live on. Over the last six years, we’ve seen corporations like Target, Walmart, and Costco make economic concessions in an effort to forestall demands for something more valuable and radical—real worker power. Now, Amazon has fallen in line with its corporate siblings. The pundits’ praise for Bezos is utterly misplaced. Praise should go to the workers, who endure brutal conditions, who have just achieved a modest yet remarkable concession from Amazon, and who, step by step, are struggling and learning to build worker power inside the behemoth. We must support them, because their success in this years-long battle will lift us all. So, let’s be clear: $15 is not nearly enough. 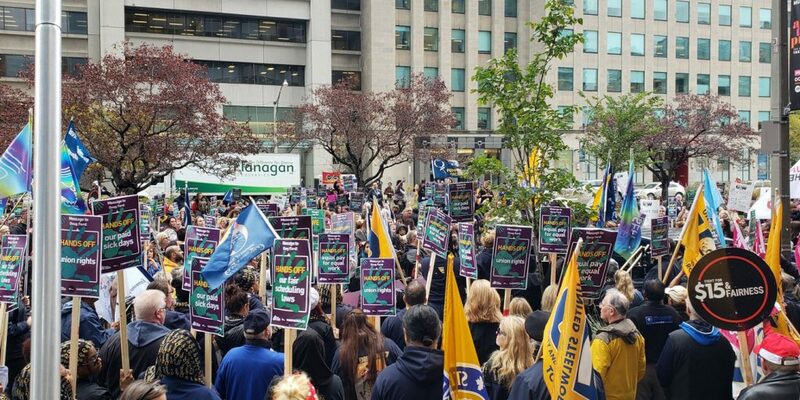 It’s time to raise a new banner, a much bolder one that demands an end to brutal working conditions and obscene profiteering, and a societal commitment to rights, security, and power for all workers. Jonathan Rosenblum is a Seattle-based union and community organizer, a member of UAW / National Writers Union Local 1981, and the author of Beyond $15: Immigrant Workers, Faith Activists, and the Revival of the Labor Movement (Beacon Press, 2017). More about him can be found at jonathanrosenblum.org. Featured image is from The Bullet.